A Timmins woman is going overseas to save the dolphin. Kelsey MacDonnell is participating in the Ric O’Barry Dolphin Project which goes to different countries, like Japan and Indonesia, to expose the message that the dolphins in special shows get captured in order to perform. The Ric O’Barry Dolphin Project was created by Ric O’Barry who was the first person to capture a dolphin and put it into captivity for the Flipper Show in the 1970’s. MacDonnell says once that first dolphin died, he has spent the past 40 years trying to tear the industry down. She says the project also helps reintegrate captured dolphins into sanctuaries. MacDonnell adds she is fundraising for the project as well. She is hosting a fundraiser to help cover some of the costs. 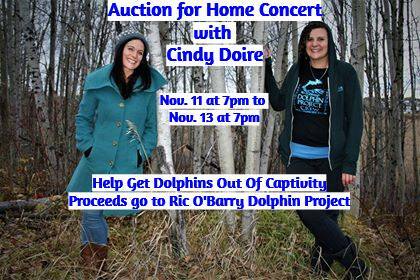 She is auctioning off a private concert with Timmins’ singer Cindy Doire. This will be an online auction that will open up at 7:00pm on Sunday and run until 7:00pm on Tuesday. The bidding will start at $300 and go up in $20 increments. MacDonnell adds that there will be more fundraisers coming up and when she gets back from wherever she gets stations, she will be able to talk openly about it. Click here for more information on the online auction or to bid. You can find more information on the Ric O’Barry Dolphin Project here.